I sure have been lax on blogging this year. I think there has been so much to process that I couldn’t find any more energy. On September 11, I got the call that my mother-in-law had passed away. She had been in the hospital the previous Monday through Friday when she was released to go back to the Pines. The next day, home health called me saying her eyes were glazed and she was unresponsive and they were wondering what to do. We decided she should be sent back to the hospital. They decided maybe she could have some morphine and then they shipped her back. Monday I got a call saying she was now eligible for hospice so Jim and I went in to set that up. We have some hard feelings about how long it took them to get her into hospice but that is another story. Her funeral was Saturday in Osmond, NE. It was a beautiful day and people seemed to be having a good time remembering. By that night though, I felt like my exhaustion had caught up with me. We drove home the next day and are now trying to get our life back together again. I have worked two days so far, subbing. I work part of the day Friday and then again on Monday. It hardly seems worth the effort. 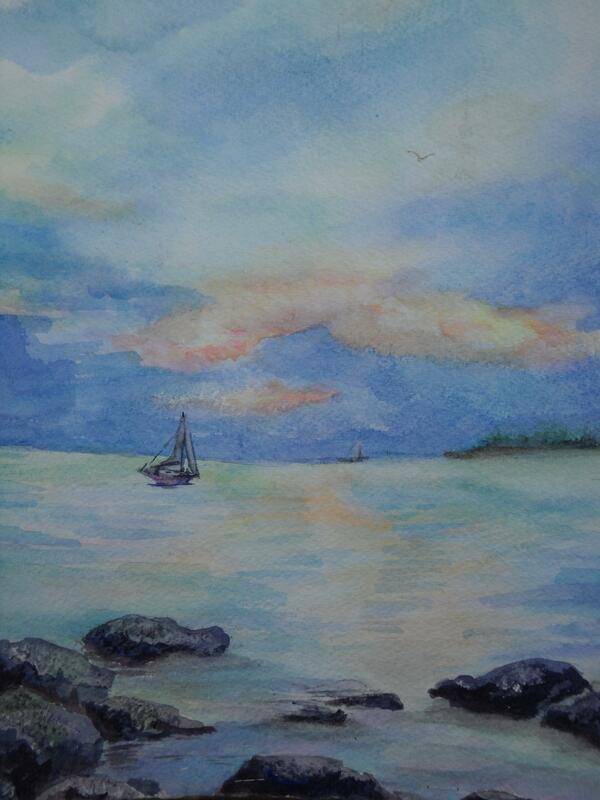 This painting is based on a picture the instructor had of a boat on Lake Michigan. 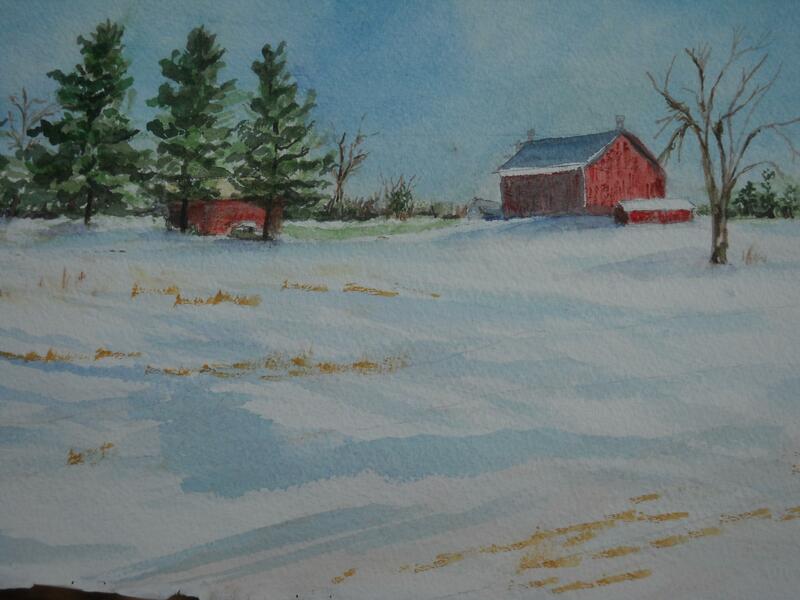 This next watercolor I can most relate to as I saw a lot of farmland with snow on it growing up in Wisconsin. techniques doing this. So you can see I did do some interesting this summer. I now need to get the energy to get going again. I have two meetings on Tuesday. After that, I am hopeful that it will be a quiet week. My boss may be having a meeting with me to answer my question of last week so if that happens, hopefully it will go ok. I plan on taking off the 28th and maybe a few more days if it comes down to it. I spent the afternoon sewing. I took a class at the Fabric Corner. We used a variety of feet, a quilt design and learned to put in a zipper to make this bag which is called a Humbug Bag. ( link should take you to a similarly designed bag tutorial) Here is another link. It was fun and I hope to remember enough of it to do it again. 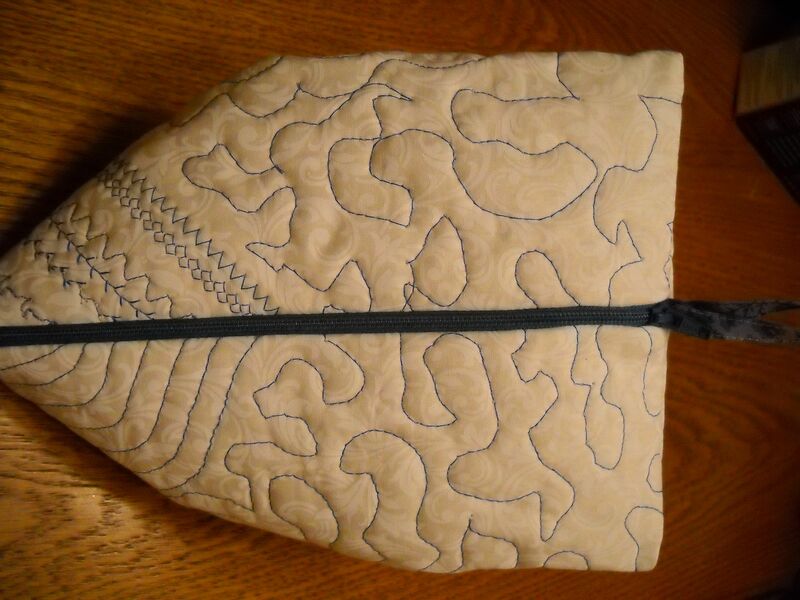 We used the walking foot, Bernina stitch regulator, the embroidery module, the roller foot and a variety of stitches to decorate this project. Not sure what to put in it yet but want to make some more to practice the sewing technques. I think it was Wednesday or Thursday, I noticed my lower back was bothering me. I tried to take it easy but it is back with a vengeance. Unlike some people, I can’t take ibuprofen as it makes my stomach hurt so I started on aspirin hoping to ease the pain somewhat. I pondered whether it could be too much tension so I skipped church and slept in but that made no difference. Tomorrow night I get to go work on my quilt blocks for the modern mix project. I need to cut the fabric ahead of time but I don’t think that will happen. Maybe I can go in early and do it. Tuesday is a big IEP meeting for my student with the biggest health problems. I was thinking about how much he has declined over the past year and it is so sad. I hope his upcoming surgery can turn some of this around but I don’t know………. I am supposed to be cleaning as the appraiser is coming tomorrow morning. We are refinancing and it would be nice if the house didn’t look like pack rats lived there. (Great time for back pain that just makes me want to lie down and rest). Yesterday was rug hooking at Judy Cripps of Rustic Rugs. I am working on my Christmas exchange mat. I have it 2/3 done. 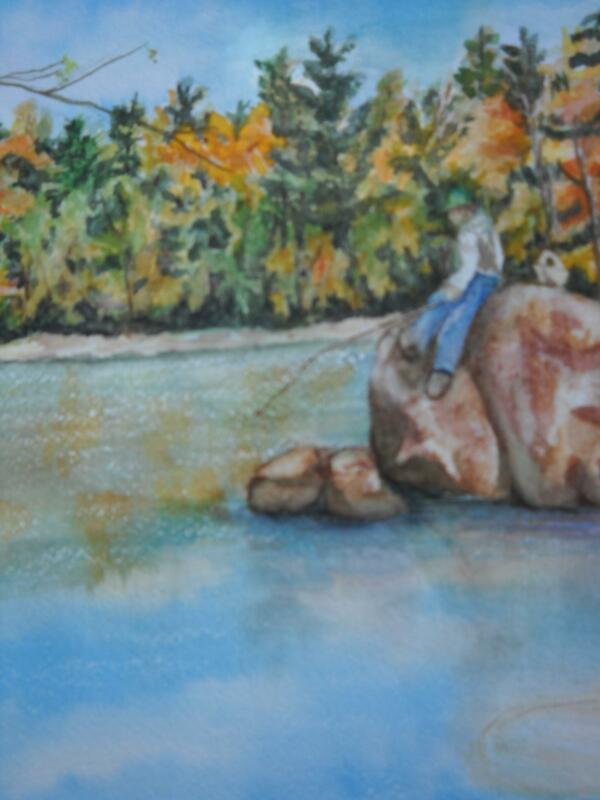 Maybe I can finish it over Thanksgiving, if I am not too busy working on my homework. It has been fairly quiet lately. I had an inservice meeting on Monday. It was very interesting and I felt like I learned a lot. It was annoying that the naysayers had to talk the whole time though. Four kids were sick on Tuesday. They have been coming back though. I have heard some nasty coughs though. I had my flu shot and hope I don’t pick up anything else. The substitute nurse that is coming in the week before Thanksgiving was in today. She thought she could learn it all in an hour and ended up calling and saying it would be all day to begin to learn all there was to know. Things may change between now and then too. I remembered I had a sewing class tonight. I was on how to combine stitches. I learned how to sew out a quilt label too. That was interesting. I think I will have to save up for the software though. So much for saving money. I actually wrote earlier in the week and never posted it as I couldn’t decide whether I should or not. The week started out ok. There was a blood drive and I was successful at giving. I had been unable to give in the past due to anemia but all the levels were good. One of my students was off at a doctor’s appointment so the day was fairly quiet. I got a new student a day later which makes for a strange class dynamic. I basically have three history classes going at once as they are different grade levels and one of the three kids has less than a first grade reading level. I am unsure how that is all going to work. The first student came back from his appointments tired out and had several days with seizures that ended up with me having to call the first responders by midweek. There must have been 7-8 of them there. It just makes me ill seeing having to go through so much. He was gone Thursday but was back on Friday. I spent Saturday at the Fabric Corner taking two more guide classes. In the morning it was all about learning some of the techniques you could do with the machine and the afternoon was spent learning about applique and free motion quilting. I hope I am about finished buying feet for that machine 🙂 I met Jim for church later and then we went out to supper. Today, I should pick things up and work on my homework. We are also supposed to pick up a loom from a friend who is downsizing. I am not sure to put that yet. There is nothing on the calendar so far for this week but it would be nice to have some peace and a chance to do a few fun things. Next week is the end of the 1st quarter. Some days just dragged and the days seemed like they were 30 hours long. The transition to a new school hasn’t been bad though. The assistant principal chewed on me a bit yesterday but it was nothing compared to what I’ve had to deal with in the past. Tomorrow holds promise. I just wish I wasn’t wishing I could sleep in. I have embroidery club to begin with. We are going to embroider a butterfly on a t shirt. Then it is off to pick up some food for rughooking. I haven’t worked on that in months. I will have to dig through the boxes to find my stuff so I can go. Hopefully I can finish up the day by going to church and getting a good night’s sleep. Sunday I have a sewing class for my machine. I think this one has to do with learning how to do buttonholes. My other machine never seemed to work right for that. I used to just sew the buttonholes by hand. It was so much easier. The cat wars are still ongoing. Shasta tolerates Riley some days but others she snarls and makes like she will attack him. I hope this gets worked out soon. I am for anti-anxiety medication for her as she has always seemed stressed out. I have seen her throw herself against the glass doors trying to get a cat on the other side. She did so well with the past cat though that we thought she would like a kitten to take care of and play with. I survived the first week with the kids! School is going ok so far. I don’t have too many students which is helpful in learning my new responsibilities. My only gripe so far is the room is very warm and there are no windows so I can’t open them. I have two fans running and one of my students ends the day looking so warm and miserable. I can’t wait to leave the room myself so I can go home and put on cooler clothes. I guess I will have to hope it stays this way come winter time. I took another sewing class for my Bernina sewing machine last Saturday. I hope there is an end in sight to all the feet that machine needs 🙂 It came with a stitch regulator for free motion quilting but hear it still needs a walking foot and probably a 1/4″ foot. I haven’t taken the class on zippers and buttonholes yet so that will probably need a couple too. What I really love about the machine is its ability to do embroidery. I have downloaded a bunch of patterns from the Embroidery Library. I have a lot of Christmas patterns I have collected and some lace. It has been fun planning the projects I will do. Progress is happening on the flooring project. We are putting wood floors in the two bedrooms and the living room. It will be such an improvement over those ugly carpets that came with the house. We have been boxing up things for days now and still aren’t finished. Before the floor man comes, I really should paint the other bedroom and touch up a few spots in the other rooms. My college class starts next week. It will be a lot of work but it will be the last one I have to take for a while. 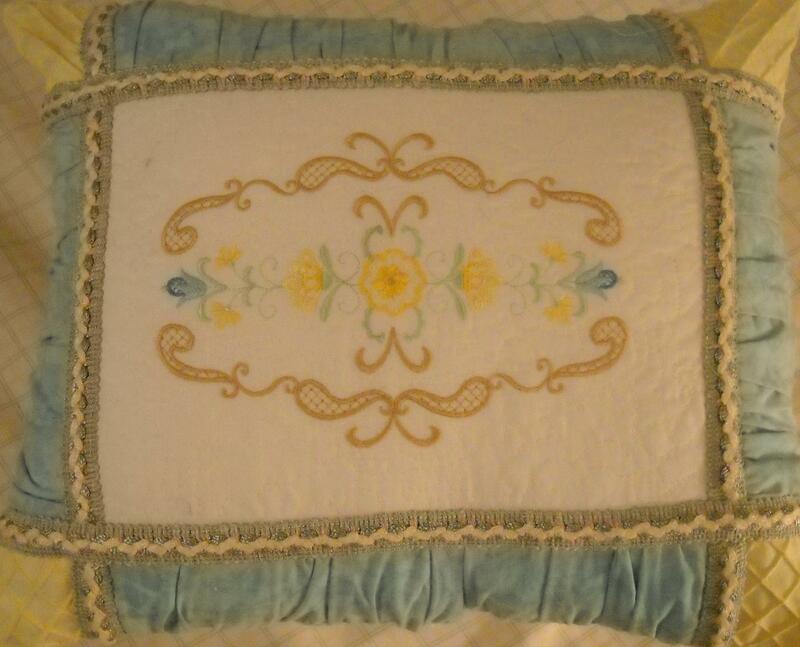 I got the courage up this week to experiment with my Bernina 630 embroidery/sewing machine. I started out making 8 lace ornaments and the top of three wool pincushions. The last project I tried was to do some cranes on a dishtowels. I put them too high up and the color changes didn’t happen and I didn’t know how to stop the machine to do it myself. 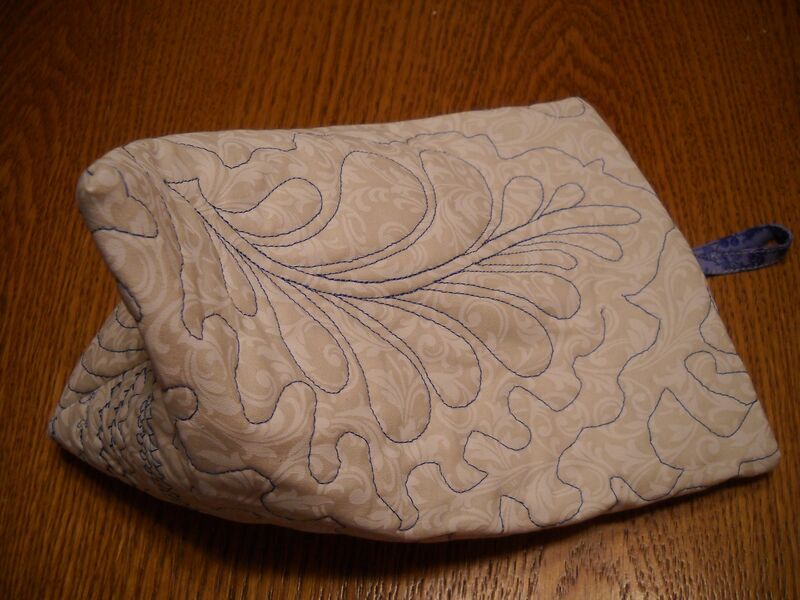 Buying a Bernina is like remodeling a house. You think you have it all paid for and then other things pop up. Yesterday, I bought the software for the Rose of Sharon quilt, the GO die to cut the fabric, a heel plate and needles as I was having embroidery issues and more thread. We are having a lot of hot weather and it is suppose to get even hotter. Which means it is almost time for work. I signed up to take a class so I can use my serger. It is on Monday. I went to the sleep doctor this last week. Instead of the sleep study, I had to do an overnight oxygen measuring level test and am supposed to take sleeping pills, every other day. I hate those as I get so groggy in the morning, not that I have energy in the mornings now………..Maybe when it gets cooler I will have more energy. I found this video on making a book….. It is very informative. It makes me want to jump in and try this. I also went into town today and bought a Bernina Embroidery/Sewing machine. I hadn’t planned to spend that much money but I got 3 years/ interest free so decided to go for the best. Later this month, Jim and I will go and take the class. My other machine was a White Jeans Machine that I won at the fair in SE Iowa. It was a work horse but was very limited in what it could do. I hope this will inspire me to sew more.